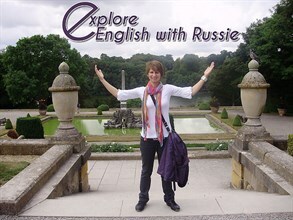 Russie explores aspects of English life, culture and traditions which many of you will not be familiar with. She also has special features: for instance, there's an idiom that she teaches us every fortnight and also an exam section to help you prepare for important English tests like IELTS. Russie also provides lesson materials for teachers - these are really innovative and go to make interactive, exciting and fun lessons. She's starting an interview section on a monthly basis as well where she talks to people involved in the world of EFL, teachers, managers, material developers. She's interviewing me for one of her October issues, by the way. However, I can't finish this review without saying something about her stories. Russie believes that there is more to this world than terror attacks, xenophobia and the like. She believes in the power of love and tolerance and this shows through in her stories which have a positive, optimistic and upbeat note. I think you'll like them. The magazine comes out twice monthly but it's not free. There's a small charge but you can have a free trial by going to the site itself.